The natural detergent breakthrough! Completely replaces washing detergent, lasts for 720 washes and is dermatologically tested. 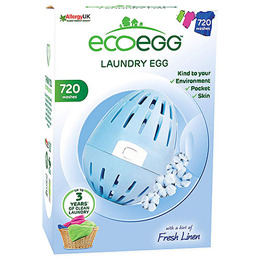 The award winning Laundry Egg is a complete replacement for washing detergent. Just pop it in the drum of your washing machine - no powder, liquid, tablets or gels required. Based on 4-5 washes a week. Below are reviews of Ecoegg Laundry Egg Fresh Linen - 720 Washes by bodykind customers. If you have tried this product we'd love to hear what you think so please leave a review. The natural detergent breakthrough! Completely replaces washing detergent, lasts for 720 washes and is dermatologically tested.